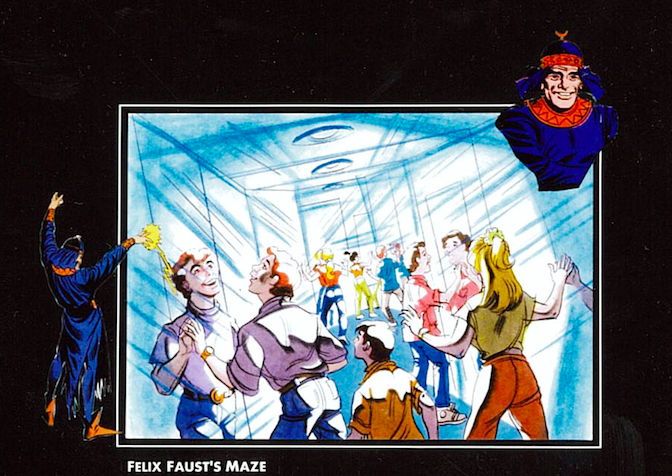 Welcome back to our series on the Islands of Adventure attractions that never made the cut! As promised in part seven of our series, the DC Comics section of the park not only was going to feature a roller coaster, but a walk-through attraction as well! The following concepts were proposed for the post-show after riders stepped off the ride. Let’s dig in! The idea of this post-show was that The Joker had gathered all of his villainous friends from the DC Comics universe to create various disorienting scenarios for guests to traverse through. 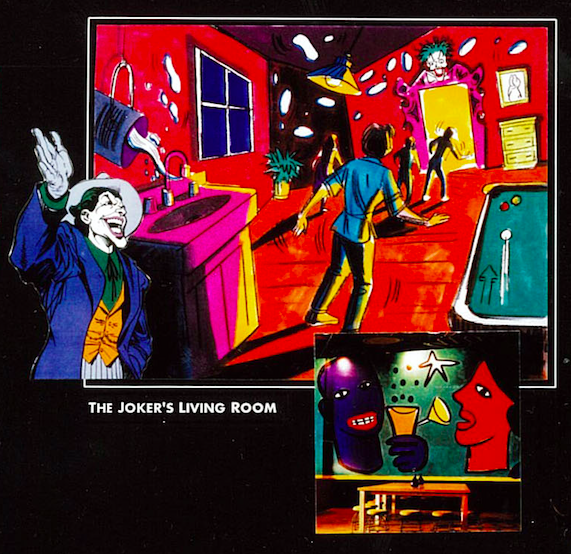 For example, The Joker’s Living Room above was all based on an optical illusion. Guests would walk on a slant and objects in the room would appear to defy gravity. Knotts Berry Farm fans will remember the Haunted Shack featured many of these effects for decades before closing in 2000. 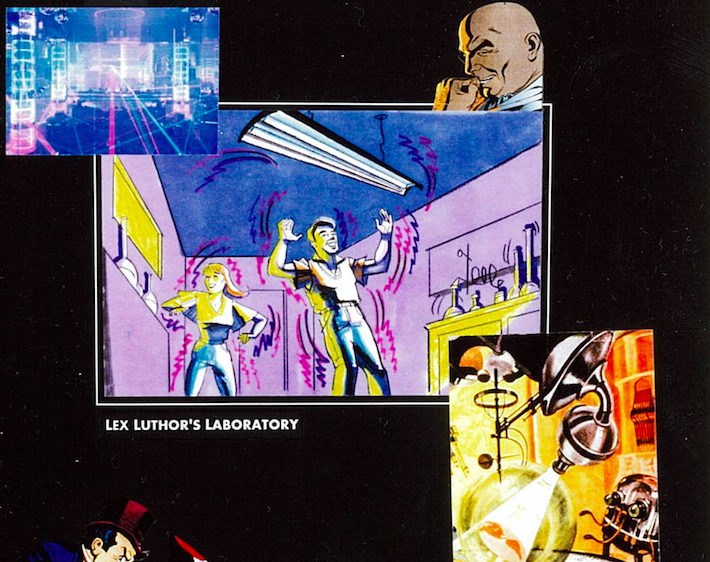 Next, guests would walk through a LexCorp laboratory from Superman’s arch enemy, Lex Luthor! 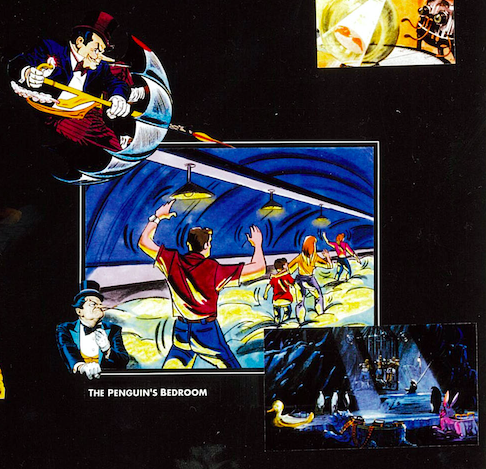 In what may be one of the strangest rooms of Joker’s Madhouse, guests walk through the Penguin’s bedroom. Naturally, The Penguin sleeps on a giant waterbed, so guests have to get through one end to the other while maintaining their balance. Mr. Twister is another one of Superman’s arch-nemesis who can control the weather. 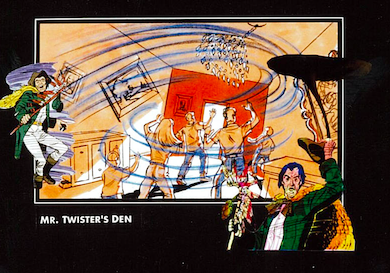 In this scene, guests would be caught in a small “tornado” while the room around them gets torn apart by the winds swirling around them. Okay friends, I’ve got to be honest. 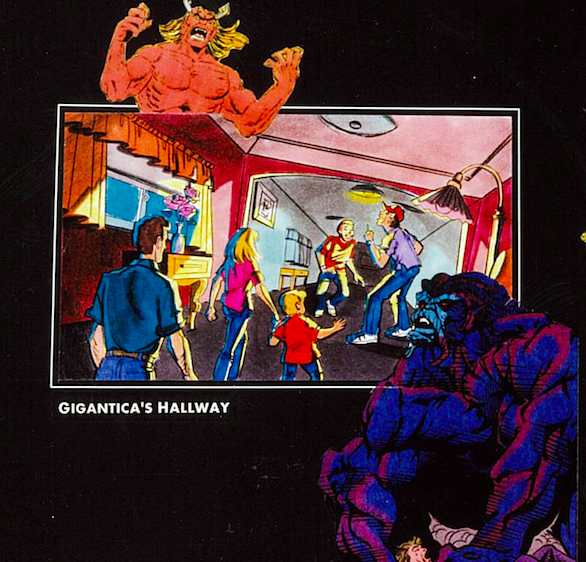 I can’t figure who Gigantica is. Any idea who this character is? I have found Giganta, which is a female. However, the characters listed above are clearly male. Also, guests clearly “grow” in size as they traverse a room and it appears to “shrink” on them as they move forward. Any TPU readers have insight into this particular villain? 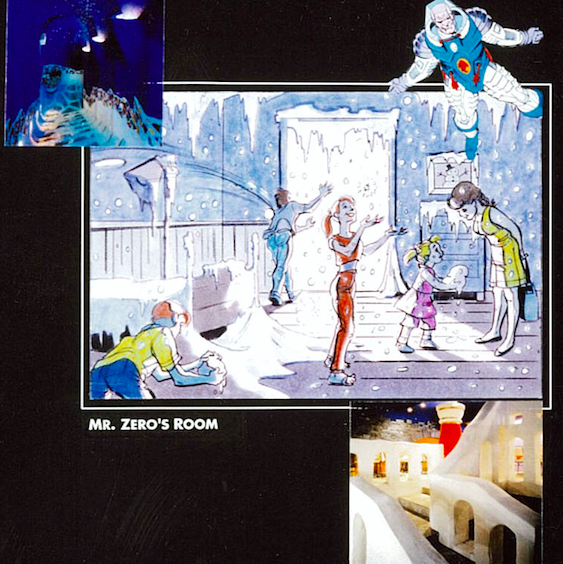 Next up would have been Mr. Zero’s room, otherwise known as Mr. Freeze. Guests would find themselves in a bedroom filled with ice and snow that they could actually touch and play with. Pretty cool stuff, huh? 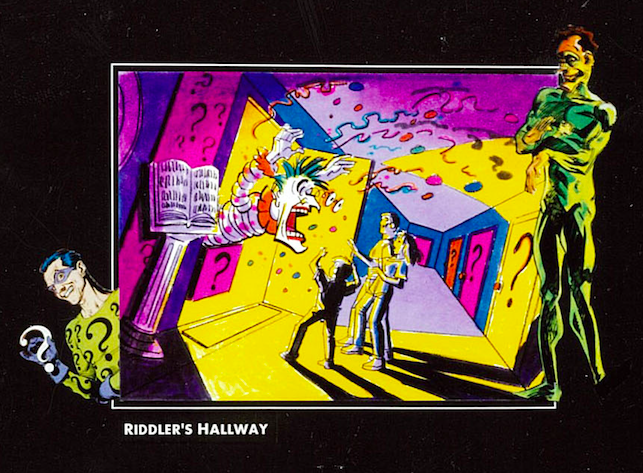 In what may have been one of the coolest rooms in Joker’s Madhouse, Riddler’s Hallway might have been my personal favorite section. Guests would read riddles places by The Riddler and then given a choice on how to solve it based on doors located throughout the hall. Naturally, there are many incorrect answers and some doors lead to jump scares if you can’t solve the riddle. Very clever. 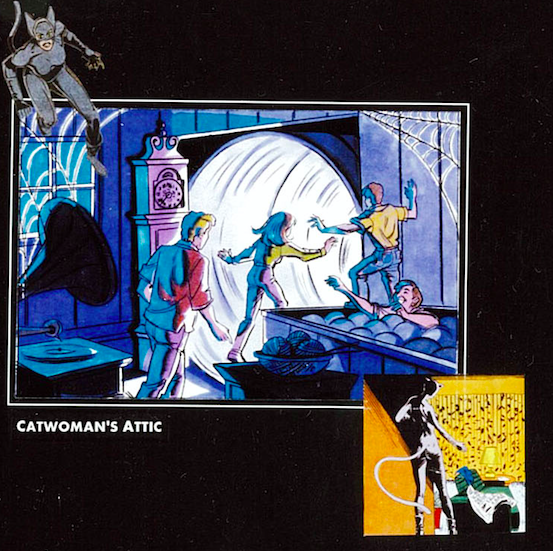 Another Batman villain, Catwoman, would have had an attic you could climb through. Guests would find themselves in another carnival classic, the vortex tunnel. Felix Faust is another enemy of Superman who can control and affect reality itself. In this case, he has created a mirror maze to disorient you. Another classic carnival attraction with a DC comics spin! 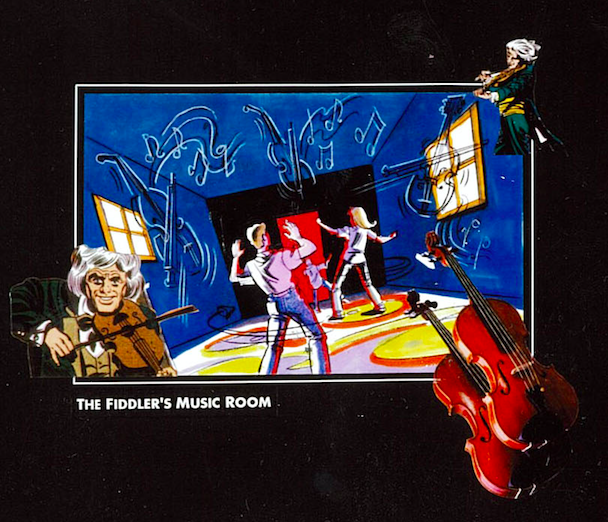 The Fiddler is a villain from The Flash comic book series. While he was in jail, he collected materials to make a custom violin. This unique instrument could hypnotize others or even shatter objects. Speakers scattered around the room were going to be used to disorient guests as they made their way through the music room. There you have it, another Islands of Adventure attraction that never made the cut. While it ended up working out for the best that Marvel got the Universal contract over DC Comics, it’s still fun to see what might have been. 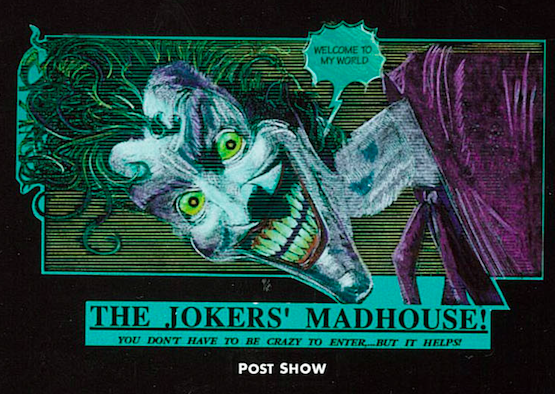 This entry was posted in Universal and tagged DC Comics, Islands of Adventure, Islands of Adventure That Never Was, Joker's Madhouse, Universal. Bookmark the permalink. Trackbacks are closed, but you can post a comment.